Although not entirely sure, and thinking I will be tested for allergies and intolerances, I am almost postitive I have an intolerance to corn. I stopped eating beef due to not feeling well whenever I ate it and I know cattle are corn fed. I know taco chips also don't digest very well, as does popcorn or corn-on-the-cob. When I heard a documentary had been made about corn I decided I needed to investigate. On a Saturday night I sat with John and my friends Cat and Jon to watch King Corn. 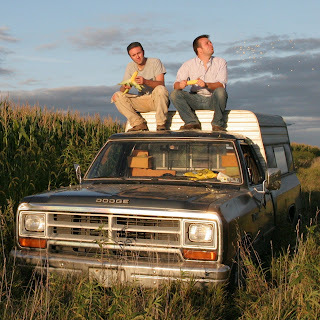 King Corn is about two friends who grow one acre of corn, the subsidized corp that drives the American fast food nation. Ian Cheney and Curt Ellis take us on a venture that raises some very disturbing questions about what we eat and how we farm. If you're into Fast Food Nation, Super Size Me and ask the question "what are we eating" then you need to see King Corn.